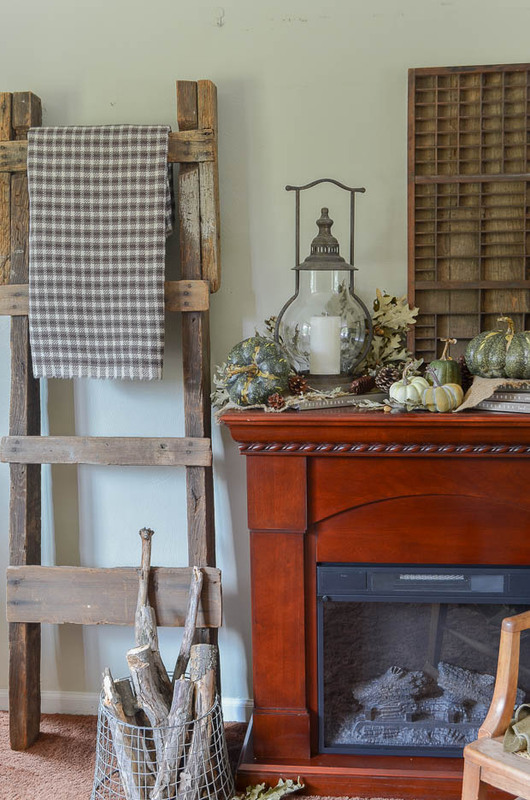 Fall is the perfect season to create a warm and cozy home. These easy tips will help you accomplish that! Portions of this post originally appeared at Craftberry Bush. 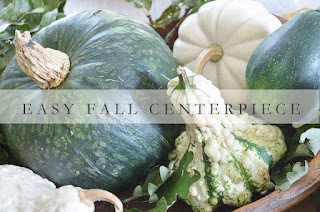 I'm so excited to start digging into some fall craft projects this week. There have been a lot of things that I've had to get done lately for future projects, so I haven't had a chance to really start getting into the fall spirit yet. They are complete for the most part, and some of the decorations got put out in the house yesterday so now I am going full steam ahead into fall crafting mode. My pumpkins are waiting to be painted. 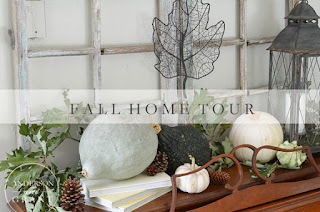 Today, though, my mind is still on decorating and getting my space ready for the autumn season. Summer is always packed full of activities and things that need done. It is nice to be able to transform you home into a beautiful place to relax as the weather cools. 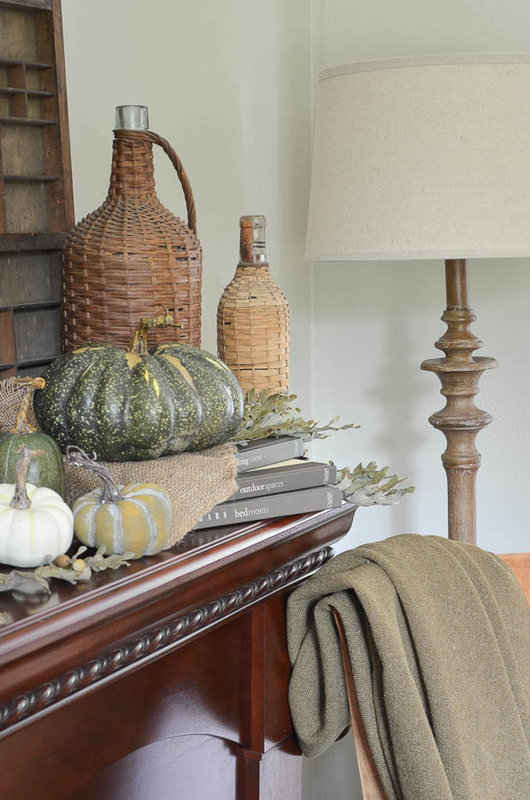 Creating a warm and cozy home in the fall doesn't cost a lot of money or require a bunch of decorations. There are some simple ways to turn your house into a comfortable retreat. I think that is one of the reasons why I always enjoy seeing the fall season approach. 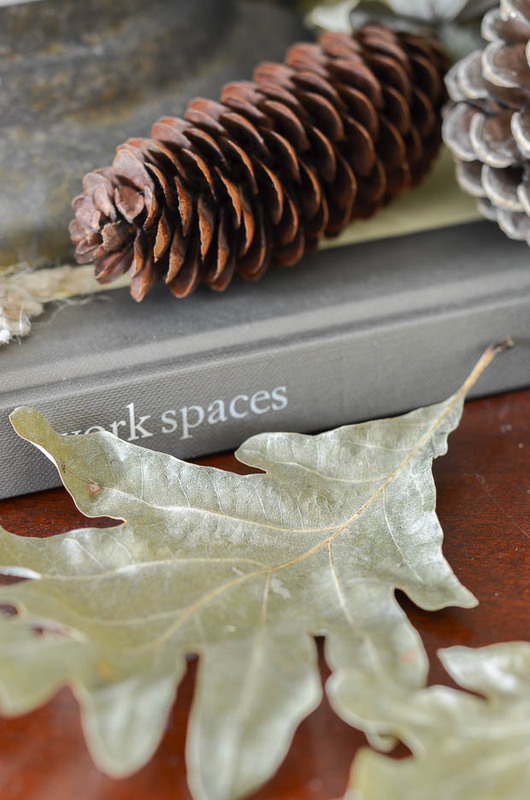 This year I am focusing on neutrals and texture in my decorating and DIY projects. 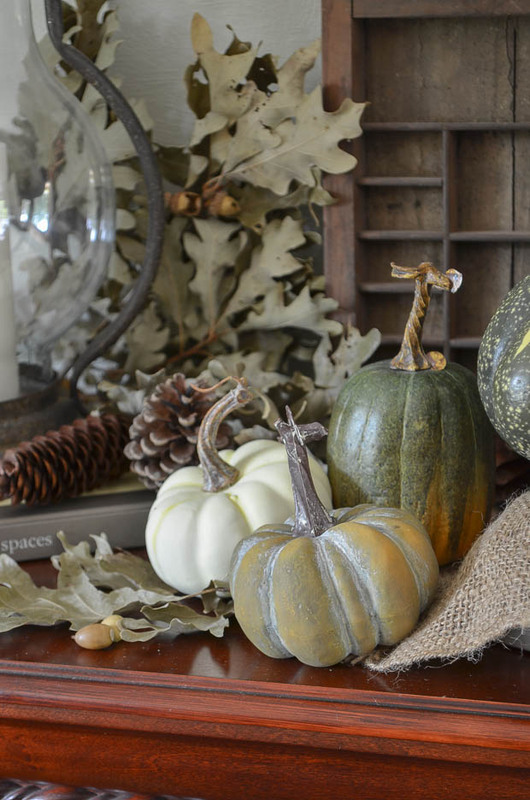 Shades of green and white pumpkins. 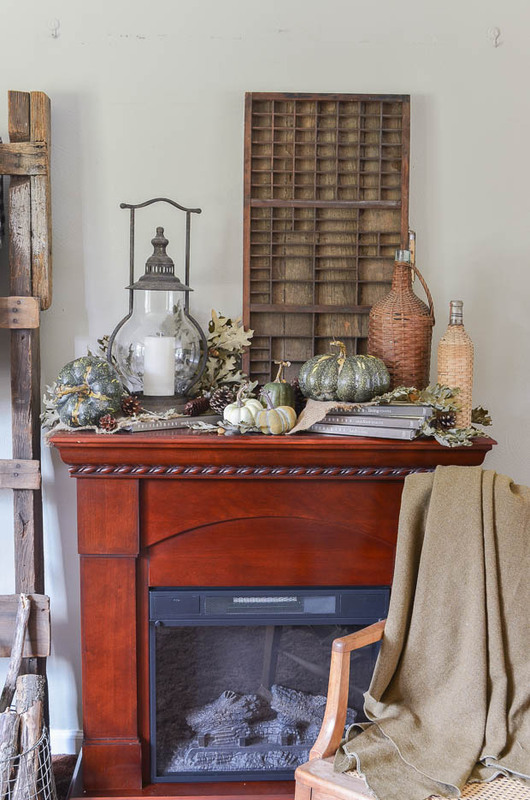 Even though they aren't the traditional warm colors we associate with fall, I find them just as cozy and very calm. Just the feeling I want to have. Having a theme or a color scheme in mind helps bring your decorating together. Things you place in your displays look cohesive and intentional. It makes it look like you actually thought about what you were putting out. I'm also finding that it helps avoid those impulse purchases that you MUST have when you enter a store. If it isn't going to work for me this year, I am trying to walk away! 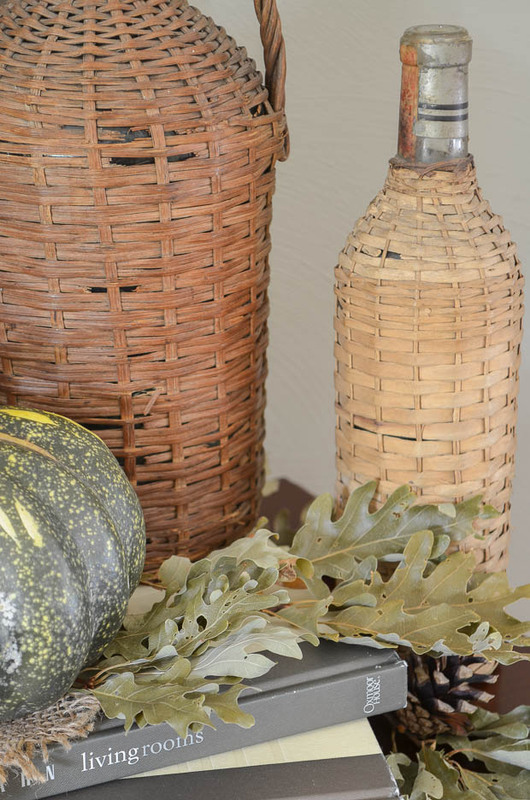 Start decorating with everyday items. I like things to be simple. And I like to be surrounded by the things I love. 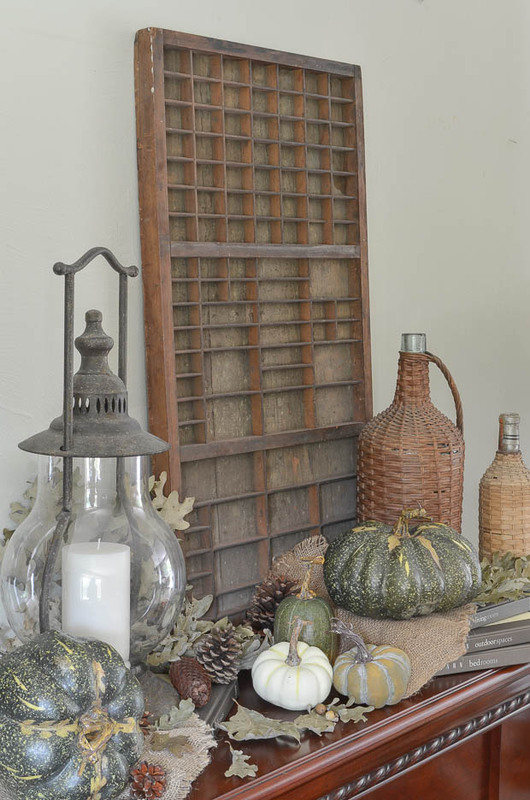 Some of the items I use in my displays are things that are used over and over regardless of the time of year. Everyday objects set the base for whatever display I'm creating. This makes your decor look natural and appropriate for your style and keeps your decorating from looking overdone. 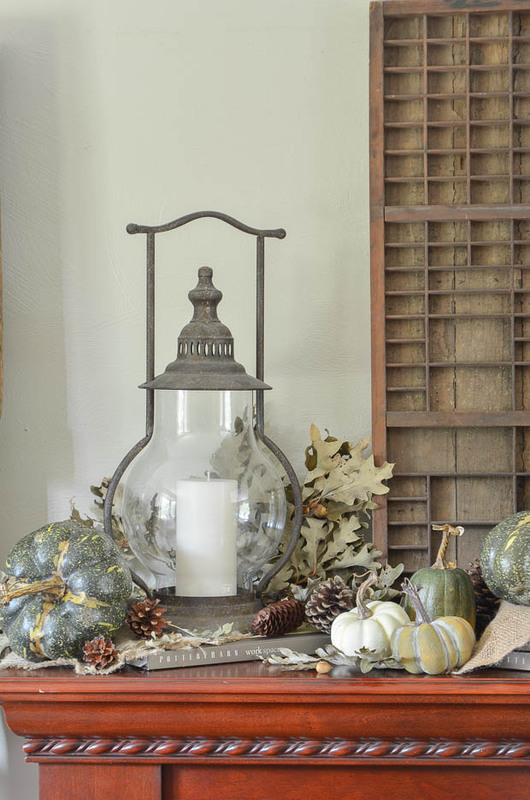 Adding in bits of fall to your everyday displays makes it look like you're fully decorated even if it isn't in your budget to buy a lot of new decorations. On this mantel, I used neutral colored books to create different heights in my display. Wood boxes and suitcases work well, too. Having different levels in a display creates a more interesting display and makes your eyes look at everything you took the time to place. Smaller items seem more noticeable when they are not dwarfed by larger pieces. 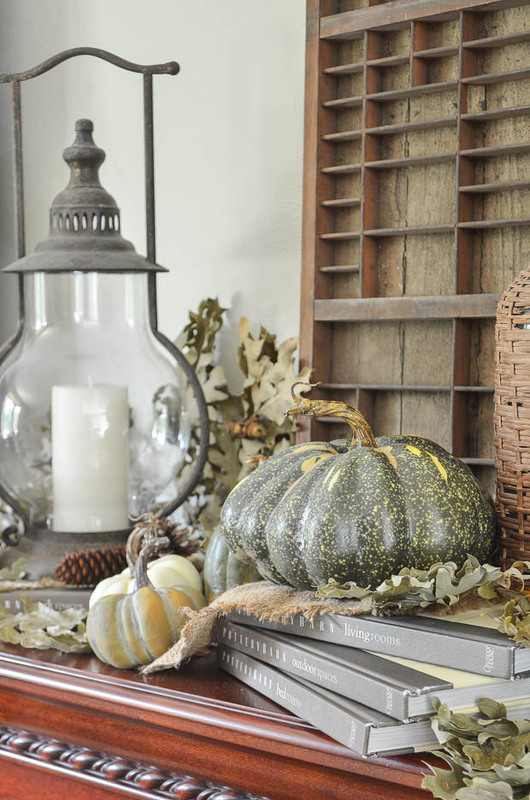 In a few places, I added small pieces of burlap to add texture to my fall display. Not so much that it is the focus, but just enough that it brings a bit of warmth. It is the little touch that can make your display or home feel complete. It seems like a no-brainer, right? 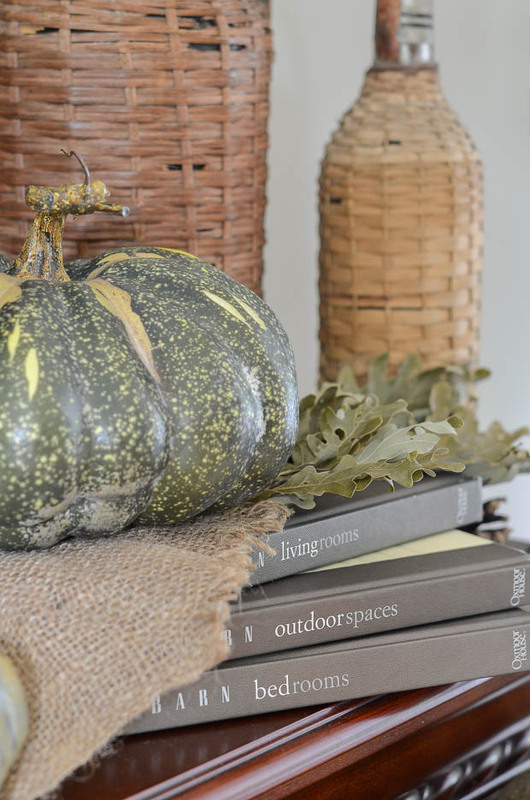 But I don't know how many times I've hear people say that they don't decorate for fall because they don't know how or don't have any decorations. 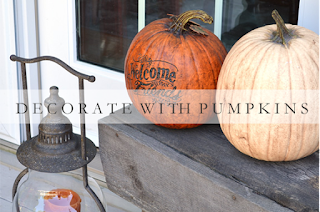 Whether they are real or fake, pumpkins are an inexpensive way to decorate for autumn that anyone has access to. 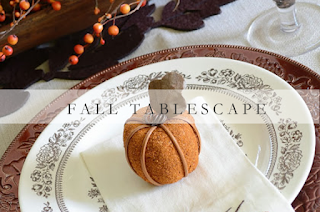 There really is nothing more fall than a simple pumpkin somewhere in your home. 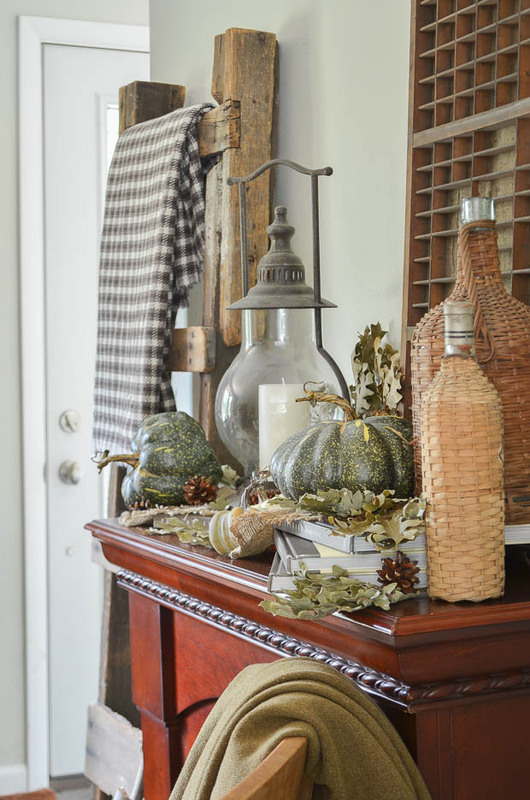 Just as adding a pumpkin instantly adds a bit of fall to anything, so do leaves and pinecones. The oak leaves I'm using here were gathered and dried last year just as they started falling off the trees in my neighborhood. The light green color that they turn as they dry is so beautiful and fits in perfectly with my neutral theme this year. 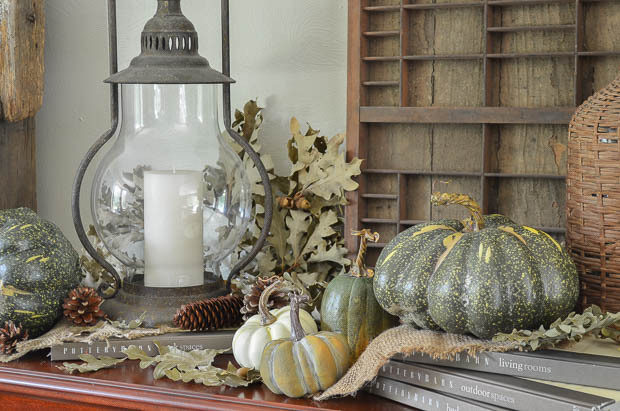 Pinecones are something I use in both my fall and Christmas displays. I keep a storage box full of them and pull it out whenever I need to add just a bit more to a vignette. A touch of nature is always beautiful and completely free. My fireplace is not a real, wood-burning one. 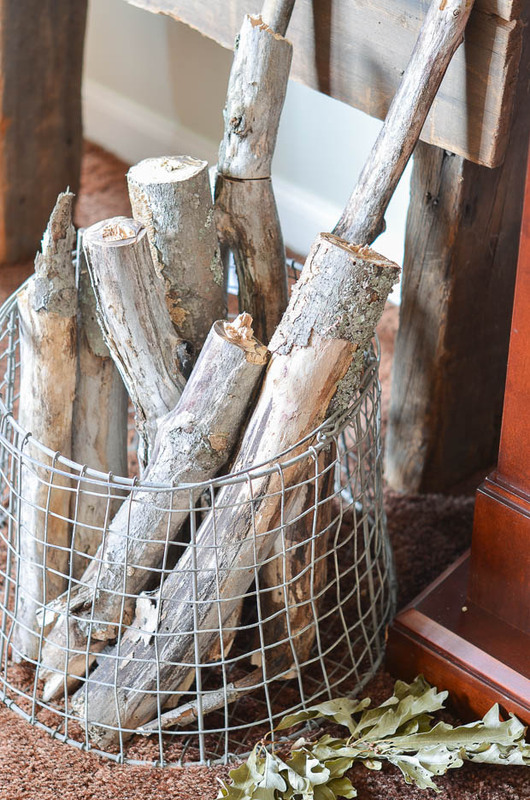 But that doesn't mean that I can't have a great kindling basket filled with logs. A piece of reality makes the "fire" burning seem a little more real! Autumn evenings can get chilly. 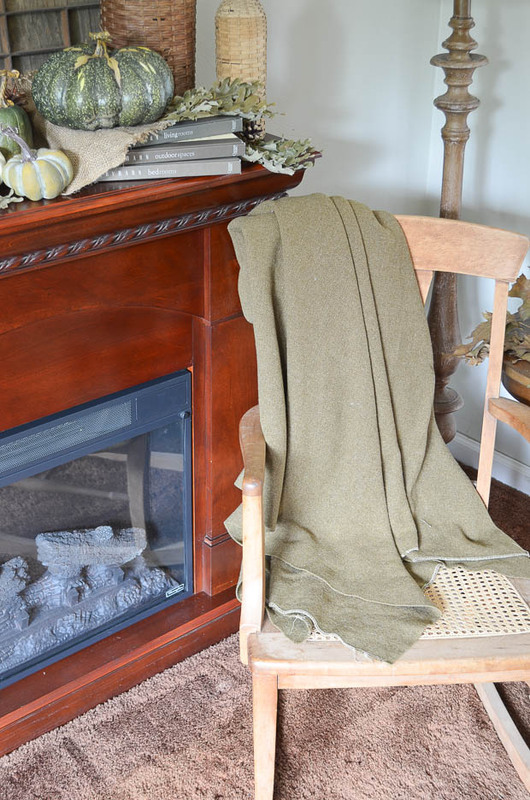 Isn't one of the best parts of the season curling up on the couch wrapped in a warm throw or blanket? Sip some hot cider and you're instantly in the fall mood. 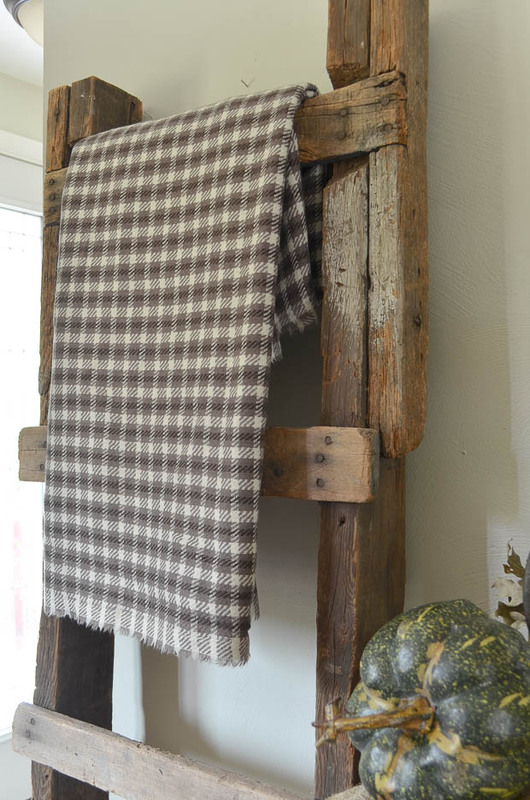 Depending on the blanket you choose, it is another way to have color, texture, and pattern in your home. Throw them on a chair, over the arm or your couch, or display them on a rustic ladder. 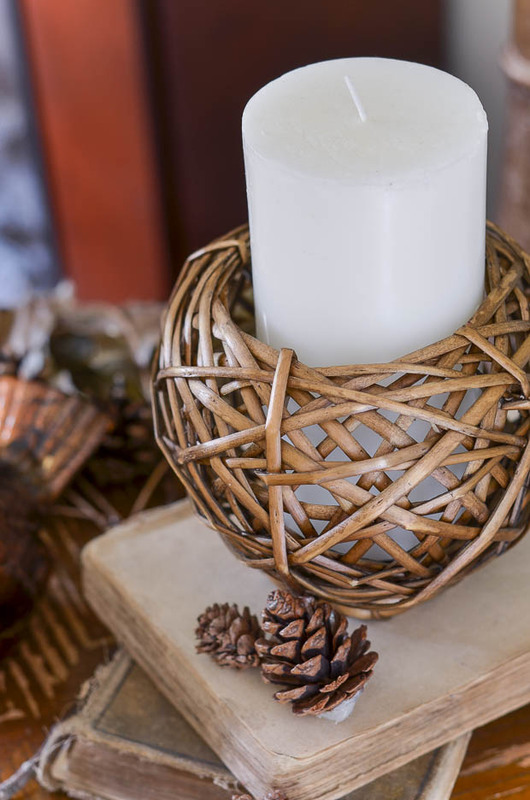 Whether it is burning on the coffee table, kitchen counter, or in the bathroom a candle is welcoming and homey. So many brands have amazing fall scents to envelope you in the season. I love walking into someone's house that instantly makes me feel at home. 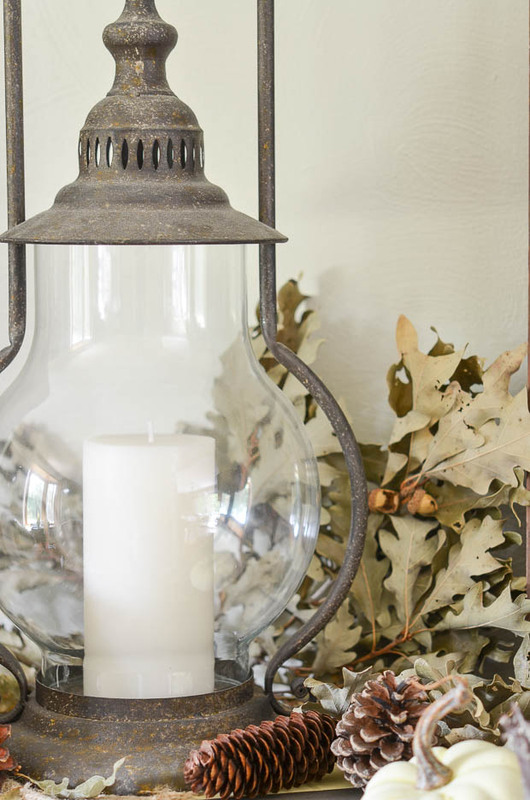 As you take time over the next few weeks to transform your home for the fall season, I hope that you'll consider a few of these ways to make your house cozy and warm for yourself, your family, and your guests. These are tips that will never go out of style!